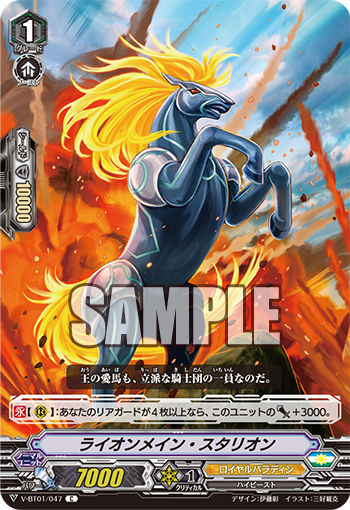 The Japanese Cards of the Day for May 21st, 2018, are Royal Paladin's Vanguard Rare from V-Booster Set 01: UNITE! TEAM Q4 and a Common from the same set, the King of Knights Alfred and his trusted steed Lion Mane Stallion. 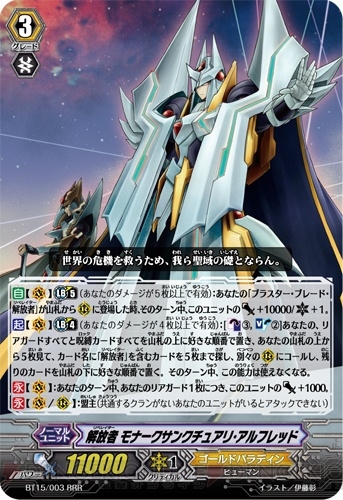 While many were expecting the cover card of V-BT01 to be a direct remake of the original King of Knights, gaining power for every rearguard in play and searching any unit, the new Alfred's skillset is instead inspired by his less-mentioned successor unit--Monarch Sanctuary Alfred. Like Monarch this incarnation of the King of Knights gains 10k for having a rearguard Blaster Blade, but this time around it's a non-stackable Continuous ability. Rather than a finisher, Alfred is a midgame card intended to push the opponent to higher damage with his (boosted) 33 center so that they can be finished by Soul Saver Dragon on subsequent turns. His once-per-turn skill superior calls Blaster Blade from the deck at a net +1 in card advantage and gives Blade 5k for the turn, opening up the possibility of SD01 Jauron levels of power with Wingal's boost. Alfred's Super Vanguard Rare print. While these skills are in line with Alfred's overall theme throughout the years--drawing power from his rearguards, calling rearguards from the deck, and giving them power in turn--it's hardly the platonic ideal of the King of Knights. 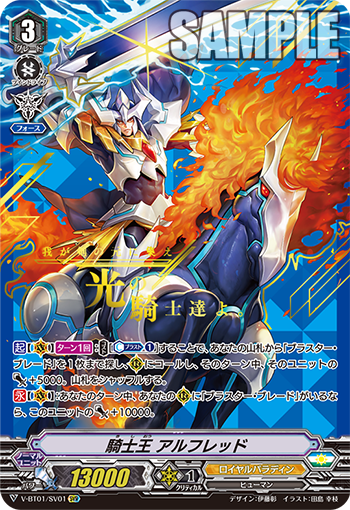 Being entirely dependent on Blaster Blade to resolve his skills leaves this Alfred estranged from the overall objectives of the deck. 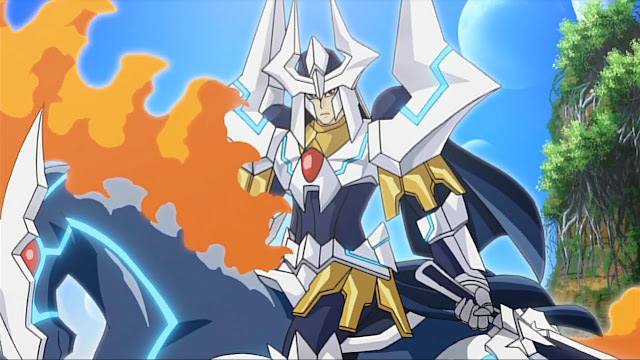 The new Blaster Blade contributes little to the Soul Saver-centric incarnation of Royal Paladin, taking away a valuable soulblast that slows down the vital SSD turn. Conjurer of Mithril is a much better use of the same cost, as he can superior call Funnergal or Akane into Pongal to restore the spent soul while gaining a net +1 or +2 for each counterblast spent on the play. 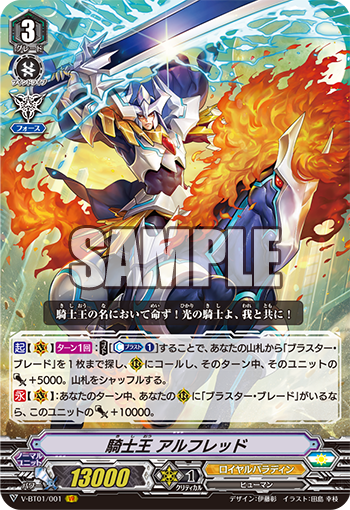 Running the King of Knights means being forced to run Blaster Blade, and the ideal use of Blade in the current deck is as a vanilla--a Gallatin with 5k less shield. The gameplan with the above decklist is to ride King of Knights turn 3, using Funnergal or Pongal (whichever is drawn first) to get the last soulcharge necessary for Soul Saver. Conjurer of Mithril is used to gain +1s, targeting Akane or Funnergal depending on whether or not that extra one soul has already been acquired. If it has, then Akane will refund Mithril's cost, and if it has not, then Funnergal will refund Mithril's cost this turn and acquire the final soul next turn. (Granted, this only works if the next turn isn't the SSD turn.) King of Knights vanilla calls Blaster Blade on turn 3 for another +1 and columns that will ideally read 23-33-23, and the game ideally ends on turn 4 when you ride Soul Saver and give 30k to all three columns. If you're forced to first ride Soul Saver that's fine, as she still gives Force to accelerate your gamestate and soulcharges on-attack to make up for missing a grade 3 ride. The only downside is being short 10k due to missing out on one more Force Marker. The disadvantage to this gameplan is how counterblast-intensive the clan as a whole is. Conjurer, Akane, Funnergal, and Alfred are all CB1. Unless you heal away a CB, the plan calls for being at 2 damage turn 2, and 4-5 damage turn 3. Royal Paladin is very vulnerable to counterblast control, and is also easily pushed into being the first to guard while at 5--the clan's winning image involves being deliberately put in the defensive position. The primary alternative deck runs Start Deck Stardrive Dragon, for its Force Gift and costless 3k. You don't get the +1 from Alfred and your midgame center caps at 23 rather than 33, but it also necessitates 1 less counterblast and can change out the Blaster Blades for Funnergal. Of course, it's also possible to cut Mithril for either version of Jauron, giving up a +1 option for higher base power and a reliable offensive. It's a matter of how you want to approach the deck. The second Card of the Day is Lion Mane Stallion, who was previously revealed at the Mexico Team League event. CONT [Rearguard Circle]: If you have four or more rearguards, this unit gets Power +3000. Lion Mane may only be a 7k base, but having a costless skill that counts itself for power gain and effectively raises the column it boosts by a trigger's worth of power makes it very versatile. In most cases the card will function as an 8k booster would, but unlike the other options Lion Mane can form an 18k+ lane with Conjurer of Mithril, and a 23 lane with Akane due to Akane's own +3 from being boosted by a High Beast. In a pinch the card will also work to form an 18 with any of the grade 1s, and of course forms a 23 behind any of the grade 3s. The king who leads the Royal Paladins, and their strongest knight. He is also the leader of the great knightly order, worthy of being called the very embodiment of justice. Always putting those who live in the United Sanctuary first, he continually wishes for battles to end without bloodshed. He is a good, understanding man, seen as a hero, to whom Blaster Blade has pledged his loyalty. The King of Knights’s beloved steed, with a fiery mane like that of a lion’s. A dappled gray horse whose mane is rarer than that of the glowing blue mane amongst horses, it is a beast worthy of being a horse of legend. Any time it hears the voice of the King of Knights, it charges recklessly across a thousand miles, breaking through even a horde of a thousand units strong, until it can rally around the flag of its master. The previous Japanese Cards of the Day were Dragonic Waterfall and Dragonic Gaias. V-Booster Set 01: UNITE! TEAM Q4 will launch in Japan May 25th, 2018, and in English June 22nd. It will be accompanied by sleeves based on Dragonic Overlord and Blaster Blade. V-Trial Deck 01: Sendou Aichi and V-TD02: Kai Toshiki will launch in English June 8th.